The Press has been very much on the side of Ant McPartlin, 42, “getting over an addiction to painkillers following knee surgery”; separated from his wife Lisa, to whom he is prepared to give half of “his fortune“; his condition connived into a campaign we all can take heart from, turning McPartlin from a man who deserves a private life into a role model; his plight told in his own words; a “source” assuring Sun readers that divorce would be “the right thing for his health.” This is “freakishly clean” Ant who in 2013 admitted to having taken drugs. Good old, Ant, then. But things have changed. 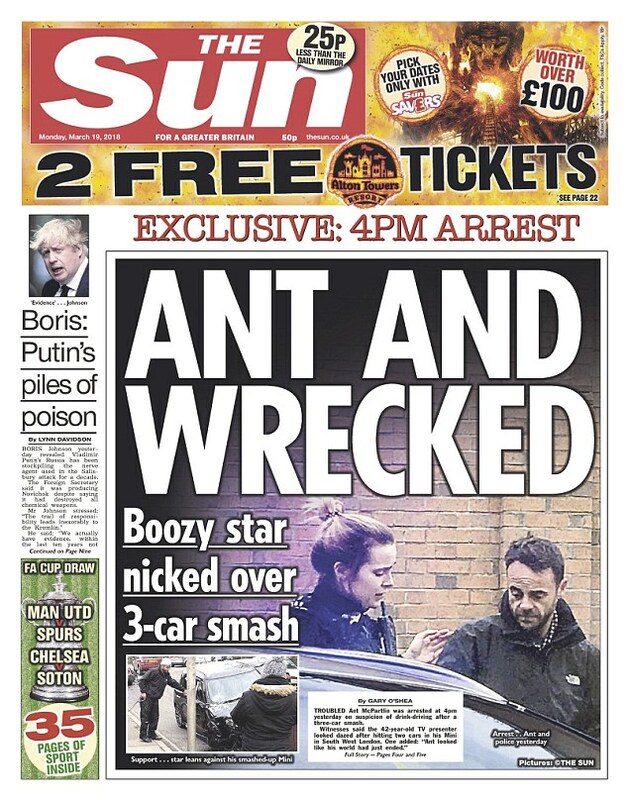 Ant has been nicked for alleged drink driving. McPartlin was arrested on suspicion of drink-driving when his car was involved in an accident in Richmond yesterday afternoon, not far from his London home. He allegedly failed a breathalyser test at the scene. He was taken into police custody at a South London police station. Worse still: the Mini his Mini collided into was carrying a couple and a three-year-old girl. McPartlin was in the car with his mother, Christine. The divorce from his wife of 11 years is believed to be costing the star around £30 million of his estimated £60 million fortune. His fortune. Not ‘their’ fortune. After his rehab stint, which was revealed by The Sun On Sunday, Ant announced he was divorcing wife Lisa, 41, after 11 years of marriage. Legal experts say it could cost him £30million. Let’s see how long this episode can be spun for?